If you can’t build it, paint it. XIT Meade County Ranch Headquarters. If you can’t build it, paint it. It applies from wanting a plywood porch to be recessed shaker panels to a relationship, it works both physically and in my head. Since I’m not a trained faux painter nor could I afford one, it’s always a project. And sometimes in life that’s all it takes to stay the course, if that is what is warranted at the time. Someone else above or deep inside knows that, and it’s because it’s best for everyone right then do to just that. The idea with this concept is that somewhere along the way the only equity involved is mine and the only capital is sweat, time, life, effort, imagination, creativity and love. 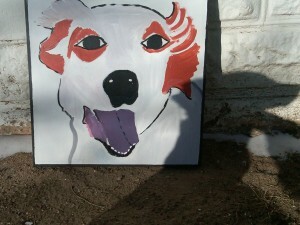 And sometimes a gallon of paint! Make lemonade! A chair of bowlies! Cook for someone special. Sometimes it’s not work you love, it’s loving your work, it’s all the same stuff. Pretending and painting it real. I did this all over the second house where we raised our family from ’96 until they were gone in ’09 and was there this last June ’12. As with anyone who returns to a former home, I realized it was now someone else’s to care for. It almost seemed as if no one lived there. In thinking back, it is surprising that this experience was quiet and comforting in a way, as I am writing this after unpacking things from the final move from my house, June 2012. Things can change quickly, so I as a historian, I wanted to get this recorded sometime around the time the changes occurred. A house on a ranch that has been a headquarters and gathering place for over 120 years belongs to so many people. 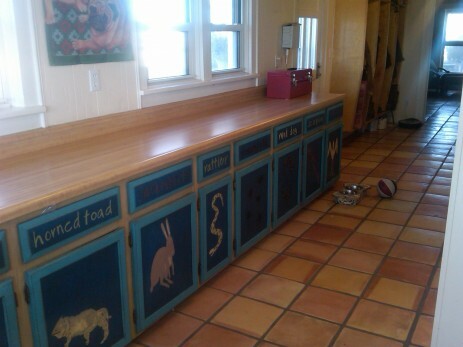 It is above all a functional place for the office and many many meals that relate to activities of the ranch. It truly belongs to everyone that has ever worked on that ranch, though there have in fact only been the occupants below, until summer ’12. If anyone claims it as home, they missed the boat and the point of tenure. We are caretakers of history and place that belongs to a whole land system. So no one ever called it Paula’s house. It was the ranch headquarters. I wanted others to feel this way, and wanted all the employees to eat together. This was unlike the former ranch foreman’s wife who wanted hierarchy of men, for her husband ate with the Adams family while cowboys all ate in the bunkhouse. For the boss, it meant business and ranching come before domestic activities in hierarchy for the space. Inherently it sets up the domestic structure as “work first” and home improvements as having “no return on investment.” A home on a ranch has little value in a real estate or relative sense to larger scope of setting. In many ways, I still like to keep the idea of any real estate investment & improvements as having some kind of return, in part as design is where I sell my services. Our situation was not unique. There are others for whom marriage is also intertwined with business for their “first homes.” For example, my father’s first job of being a marine began with their early instruction to enlisted men that they were “married first to the marines.” My mother’s parents ensured that she was not in military housing and they lived off-base at Quantico, but there was no “off-ranch” housing for the debutante bride. I had sweat equity and paint to invest of myself to make it my own, and I gave it my all. 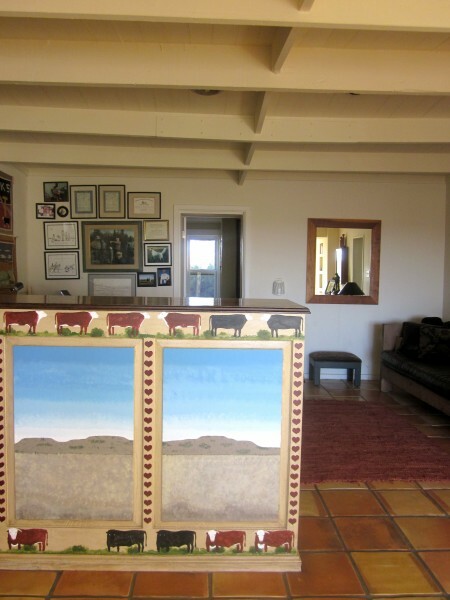 So back to the ranch history…. I never examined the title to this headquarters in depth, for I was too busy living the life. It’s at the Headquarters, about 12″ thick. But, from my own knowledge it is assumed that there was one homesteader who proved up the claim, before speculators moved into area and bought up some land along the river which was then used for commercial cattle production. In case of the early history of the XI Headquarters, prior to ownership of William Robert and Colonel Charles Summers (absentee business owner), the property was operated by McCoy Brothers. No further earlier research has been done (by me that I sought when I had tasks with website), but it is assumed that this was an association with McCoy Brothers that operated many ranches in early years of cattle drives during post-civil war. Dodge City was the closet shipping point in that region in this period around 1880s. 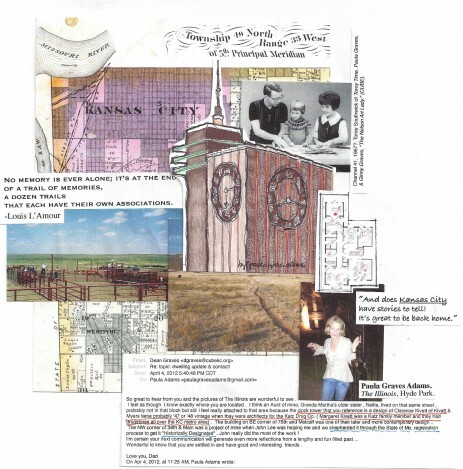 Here’s a scan of a brochure I did of sequent occupancy for the Kansas State Historical Society Tour that came to the ranch over a decade ago. I will likely tell more about this in a later post as the timeline shows key events that coincide with ownership and how it changes hands over time as well as how agriculture and production change. Sequent Occupancy and XI(T) Headquarters Evolution of Spaces. The study of succession of people that dwell within a house in a linear fashion throughout life of building is called sequent occupancy. I did this with a ranch in the Flint Hills, studying also the evolving patterns of use within the house and outbuildings over a 100 year period, adjacent organic patterning of lands that supported this house by various families that move in and out, merge, divide and or are re-grown over time. Nothing is ever the same, or can stay the same to exist. Change, adaptation, evolution is integral for survival of anything, buildings included. But back to this house. I’ll quit talking, here are a few pictures of the “after”, or as it is, the present, summer ’12. John Adams chaps over Ginny Graves couch. 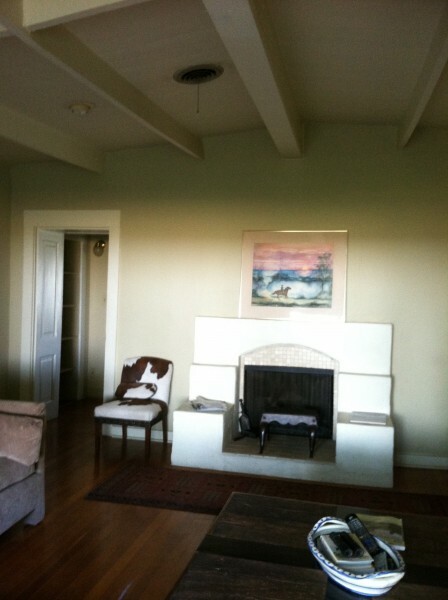 Fireplace I designed, John’s dad’s chair I reupholstered in cowhide, John’s watercolor painting of his father riding a horse painted by his mother’s artist father, John Gorbutt. It looks very beautiful and simple and quiet. It looks like my father-in-law’s who was most at peace, alone, with his land. I think in the end, they will remember that the women did their jobs, just as the mother cows do theirs, by instinct for survival and to protect children as they see best while it is their responsibility. This landscape is one of nature, animals, and men who understand that humans are that. Land parcels and employees shrink, but expenses mount. What was historically slave labor and a part-time staff of transient cowboys becomes a very cared for and well-employed existence. There is no bookkeeper or secretary living on the ranch, and it’s a staffed by a handful of people. Overwhelming in such a primitive and isolated existence with DSL, but rancher’s do it. 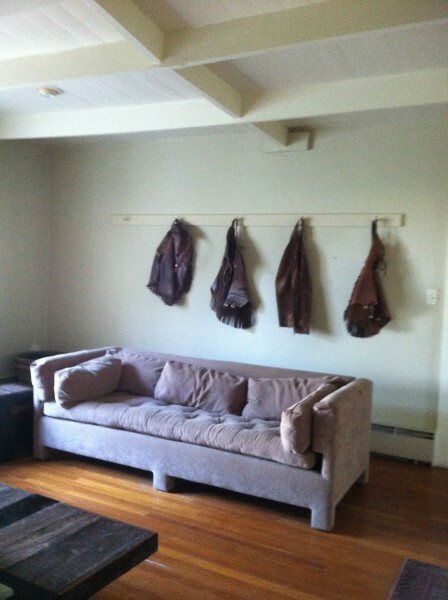 So, with no money, I wanted to make any improvements I made to the house elegant and historically appropriate. Below you’ll see the minimal additions of fireplace, corner tv cupboard, and work-laundry stations. 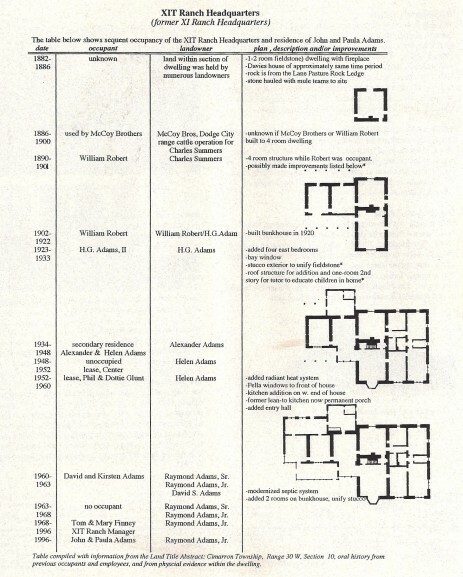 The entry hall’s first room was John Adams office. That is, I heard both John and his father say, “Don’t think I’m livin’ out here for my health!” It was work, and we were the workers to nurture the next generation of ranch-raised Adams in that XIT Headquarters. It was something I was committed to do for life, good, bad, indifferent. Plus, it’s a pretty good mindset for how to get two kids raised with two parents and a good enough marriage which remained intact through an unorthodox lifestyle of two high schools in two cities and about 40,000 miles on my car a year for domestic driving. I was never bored. then it is because I am boring. though at times I wish I were. 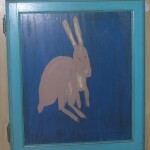 But, with travels to Santa Fe and primitive painting an appreciation, I did handpaint cabinets for a little New Mexican Artist’s folly. It covered an boxy oak cabinet divider that was hauled into the house to separate John Adams desk from the entry hall when one entered the foyer. It’s final morphoses was to be a leather tooled landscape to “panel” the four sections, with image of horizonline of the river and cattle crossing from a family photograph. The former divider, pre 2012, during tenure of John Adams Family. Painted stuff. That is, this painting was just “en route” but it definitely filled a need on those dark days when the bathroom floorboards were wet and the red ants and mold would appear. It probably wasn’t appropriate for when son became Boss, but it filled the bill in the whimsical years of young children and middle-age marriage. I also did drawings to duplicate dimensions of the historic 6 panel doors. This was done, minus the sticking, so it wouldn’t “mimic” history and fool any viewer as to historical accuracy. They replaced cheap hollow core that a foreman had put in during the time period when the Headquarters was a tenant house. It was a major improvement, and looked as if they had always been there. The Talavera Mexican in the kitchen, of course, would never have been there. The local Mexican Revolution was a (relatively speaking) recent change in the southwest Kansas landscape that came after the pivot irrigator, corn, feedyards and packing houses all moved west in the 70s and 80s. We kept the same alder cabinets with chrome pulls of the 1950s kitchen as I felt that things all come back around and they have. And with private schools a personal high school choice, there was no money or time to re-do a kitchen (wouldn’t anyway, I loved it!) or bathrooms (yes, I would have! as mentioned there are red ants and wet underfloors..mold, ancient toilets from the 60s….). But back to the place. Here are the before pictures. They seem funny, don’t they? Who was that nut, some broad from Santa Fe? or a Kansas City chick who grew up at an art gallery? She lasted 28 years??! They said she’d never last six months! Modern-Wild, colorful, imaginative, happy and wet in a landscape that to most appears archaic, tan, static. The color selection, though it may seem odd, made reference to the Mexican tile added to the kitchen as backsplash from counter to cabinets. That is, the navy in the center and torquoise of the outer door frame matched the Talavera French fleurs-de-lys which tiled the perimeter of the kitchen. 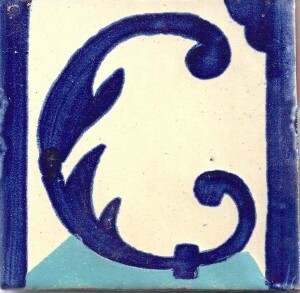 Talavera fleur-de-lys tile in XIT kitchen. 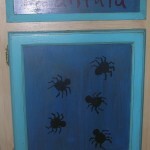 More laundry room painted stuff, pre-2012. 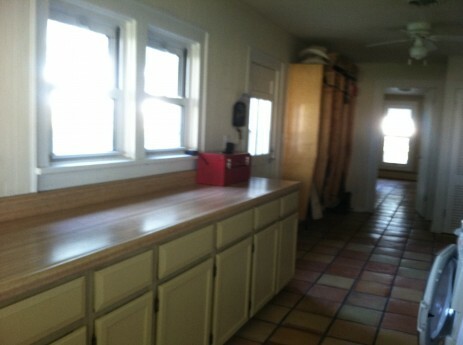 XIT Laundry Room “Before” beige tan overpainting without primer :). The southwest Kansas landscape is not dull at all, but bland to the untrained eye and “slow” by today’s time clock visualization of “action”. But nothing ever is unchanging. It is a vast landscape so harsh the Indians left it alone, and even the Comanches dwelled there only a short time. It was always meant to be empty and void of people. It works best for those who are content to operate without community, perhaps even functioning best in absence of it. I hope that I did not become one of them, with the requirement to stand alone. I did embrace the ranch lifestyle to experience each moment. So my point is this…. the wild colors were perhaps what I saw in the place where I lived, alive with all these critters of the landscape, and full of color. The places where I felt more connected in history and might have felt sweet sad were Jack and Lacy’s bedroom. They looked exactly the same at the time that I visited. That is, except for a little “I’m putting it here” empty nesting going on that dad did and all parents do when trying to collect their children’s belongings and re-claim their space. When I went into Jack’s, there was a monarch butterfly that somehow had gotten into the house (with me? or was hanging out in Jack’s pad while he’s at KU?). I knew I wasn’t there alone and it made me feel happy. I would still and always belong in some sort of way within that house. Maybe everyone feels this way when they knock on that door of their childhood home and ask if they may see where they had lived while growing up. It’s much much easier to remember it than it ever was to live there, day in and day out, though I only realize it now that I am in a city. As for raising kids here, it was a lot of fun and we had each other and the ranch. But, it’s funny, the laundry room was very noticeable to me as I spent hours in here. It was like a runway, so big, but animal blood-soaked laundry caked with manure was plentiful. I made it super efficient in a minimum of space that I devoted to micro-design organization. This was for the totally selfish desire to eliminate annoyance with anyone else about clothes piling up, taking to room, etc. My goal was always to design away angst, and then let go of control and let chips & towels fall where it may. It was as it they had not used primer or perhaps it needed another coat of paint as there was something dark coming through. There was some shadowing of the former two-color tone and it had a bluish cast, but I couldn’t see any critters. 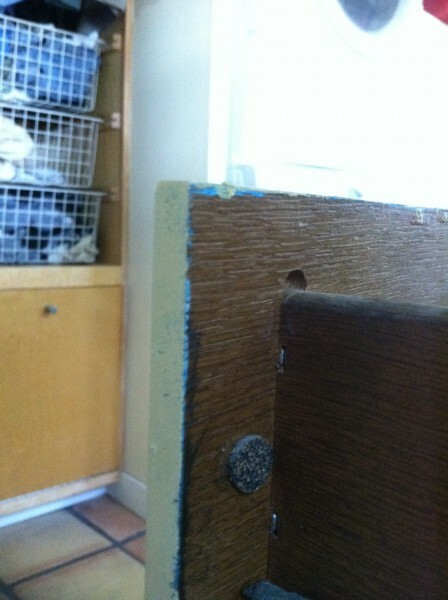 I thought maybe they had even used a sander. But, then I opened up a door and looked and found this spot. Yes! And I knew, someone at some point, if they studied that house and really looked as an architectural historian does, would know there was another story besides the beige. That I was there, and there was color! As both KC Mo housing and my sister said for re-sale, “I don’t think that’s what anyone wants to see” but it is what I wanted to see when I was in there doing laundry. Laundry always feels pretty good and cleansing at times, or a least necessary. I painted a picture and while I was there, I got to look at it and it made me happy, it made me feel good. There is always a clue someone forgot to erase….the historian building detective. And here’s what it was like from about 1997 to 2011. Enjoy, all these critters were right there living alongside me down there on the Cimarron River, some in the house :). And we all did laundry together, my friends and me. 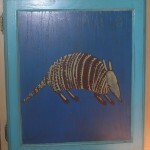 Armadillo….yes, in the yard! The jump straight up! Tarantulas on the highway…..looks like rain. on the wall or in your mind. Pretend when that works, make it real when action is required. And then do it again, if not in the same place as it won’t ever be the same way, in a new place, in a new way. Life is short! God has a plan, and I think he uses a lot of paint. Isn’t this why we run? Because we are always running. Running around doing or saying or something. and returning to “place” that never is the same. I have returned to Kansas City after 30 years of living away and I am doing just this, every day in every way. Friends, family, childhood places and spaces, re-visiting a history of mine and of the City Beautiful of Kansas City. I Won. Get the isolated picture? So now while enjoying urban life and the KC CoffeeShop Scene at Eddy delaHunt’s, I ran into Dr. Tom Pierce from whom I request all kinds of tips since my return to town. He handles just about anything with higher than average street knowledge of KC history and cultural geography, running groups, training tips, Westwood Hills homes, and where to find a person of male persuasion with whom I might go to dinner (no longer a point of focus)… (BTW, his recommendation for me was The Linda Hall Library). So here’s the pathetic picture of me struggling in at the final stretch. My goal was to break two hours, which I did not. I think maybe 2:05 or 2:07. But, he did give me tips on how to pace myself throughout the race. Why did I only look up the date of this race 3 weeks ago and think I could do it? Thanks alot, Tom. 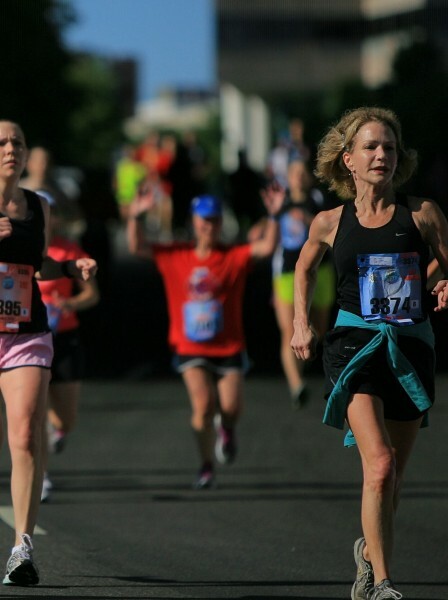 So, my approach in counting down the weeks leading up to hospital hill as a guest blogger, are to pass along both his instructions and my own thoughts as I worked my way along the course through streets of my past. I’m an architect and preservationist, with a heavy dose of ADHD when I’m not in hyper focus. on body chemistry and pace. Tom is both a Dr. and Chemist, I believe. It’s somewhat similar to what my cousin Gretchen told me at the start of my race of the last two years when encountering friends, family, foes?, fear and complicated factum. and an excellent approach to life. Goal: Paint Happy. Medium: oils. Destination: Tucson. So, the early tools were crayons, pencils, markers, and used line as expression. As with everyone, I started both with pre-school art classes at the Nelson and in grade school with those powdered tempera artista paints. I can still smell that smell, because I always thought it smelled a little bit like, for want of a better word, barf. Well, I think that’s what it was, but maybe it was just that shaved sawdust like stuff they sprinkled over it when a person got sick all over their food tray in the lunchroom (me. I’ll never forget it and how everyone recoiled in horror, tripping over the lunchroom bench to get away with disdainful “eeeyyeeewwwwhoooaaahhhyuuuuuckkkk!”). By the time I helped my mom with her classes at Corinth library, they were pre-mixed in little plastic squeeze bottles so the mixing we had to do at Cedar Roe Branch of the Johnson County librairies was a thing of the past. This was my finest work from that painting period. 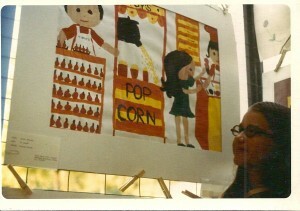 It is a picture of me at the Prairie Village Art Fair where I won first prize. First Prize, Prairie Village Art Fair. Topsy’s by Paula Adams. And, I pretty much stuck with this style and used it in books for French classes I taught in my mid-20s, shower invitatations, Christmas cards and maps. It’s basically just a bit of embellishment on the stick figure, and it’s worked pretty well for me on many occasions. As long as I can draw a circle and lines, I pretty well had the figurative part covered as far as I was concerned and moved on into the details which are what I really liked. All the little patterns, squiggles, repeats, and organization of whatever the topic might be. Achieving order in organizing detail, that’s what it was all about. In thinking of all of these things, I may have to do a blog post showcasing this fine body of line d’oeuvres. 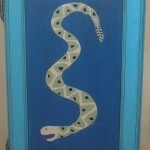 I really don’t remember any other painting or drawing classes that I took in public school education. I’m sure I had some in grade school, but I mostly have remnants of that with clay objects. All of my drawing really came from home and from “work” when I was called upon to be the guinea pig for an upcoming workshop she was teaching, article she was writing, or book for which she needed an illustration. I loved this job, and if I could have someone put me to work like this right now, giving me some framework, supplies, task and a purpose I would feel I’d died and gone to heaven. It’s my job now, and I’m only just now realizing how wonderful it was to be gainfully employed with a sense of purpose while growing up. I had my second formal painting class after I had Lace. The first was when I had worked with oils in a sort of “academic” class that my mother had found for me with a private teacher on Johnson Drive when I was in high school. She had a real bunny, and I modeled a Durer like rabbit, painted a cezanne-like-but-rounder Granny Apple Still life in oils, and learned some basics on making things look “real”, that is “realistic” by using line, shadow, and light sources. We worked dark to light, as I did in later classes, with the white being the “high” spots from which light reflected and applied last to bounce off the rounded apple forms. When I first learned to paint in oils, I think I only did about ten paintings. I’m fond of them. The choice of using oils, for me, was often a time factor in projects that were sandwiched in-between degrees and jobs and driving of kids both in daily country commutes and intra-state then for our cross-country secondary education for the Adams. That is, finding blocks of time, studio setup and takedown, portability and the drying time necessary with oils later became a challenge. So, as teaching, architecture school, work, cowboy cooking and family life changed, so did the medium to acrylics when I finally had a minute to return to paint one spring and crank out the “Dead Dog’s Portrait Gallery” Series. These are the three “types” of oil paintings I did in class with Steve Heckmann at Seward County Community College in Liberal, Kansas. a “landscape” of sorts that was a painting of Monet’s gardens at Giverny. I visited their with my Grandmother in summer 1980.
a still life of artichokes from a picture in a French market that same summer. the last was the first of a series of pug portraits, one for my parents, my sister, and finally one of my own two dogs. The last oil I did was that of Lace with our black pug Mei Rose on a kilim stool which I showed in a blog post this year before Christmas entitled “what is real?” So, I had classified myself as the bourgeois painter of middle class subject matter in theme. So, back to my pursuit of a mentor-painter-teacher. After learning I could not paint with Stephen Kilborn (watercolors) in Taos, I found a woman in Tucson who I knew would fit the bill when I saw her work. I sent her my history, my portfolio, my mini life story and waited for a response. And, it was exactly the conversation I dreamed of having when she called. My pictures had said a thousand words, my story gave all the depth of family history in arts and angst. She embraced me and invited me to come and join her regular classes when I was in town. I am very grateful and so pleased she took me in, to get back into the classic oil medium and put brush in my hand. She applauded the academic efforts while acknowledging both my timidity and need for a nudge from the nest to express. Though this painting was done in acrylic, which forces a different speed with quick drying times, it best expresses what I think will be my challenge and task in the upcoming month at this class. That is, to be free and paint happy. Trey portrait with Trey in shadow looking on. by Paula Graves Adams. It doesn’t mean it has to be perfect or done. That is the beauty of oil which can be re-worked. And I would now be able to return to my mother’s original encouragement to express. I’d earned the right to clothe my canvas in the elegant fabric of oils, but this time with folly. And I like that, it’s like life. a plan that grows and changes over time. Each layer adds depth, unfolding an evolving idea while gaining the patina of age.